In many laboratories, different applications requiring different columns, mobile phases, and other chromatographic parameters are performed on the same LC system. This usually necessitates the manual exchange of columns and mobile phases to adapt the instrument to the desired application. The Agilent 1260 Infinity II Multimethod solution facilitates automated solvent selection typically using up to 15 different mobile phases and automated column switching between up to four columns of 300 mm or less in length. This setup enables the use of more than 100 different separation conditions without manual system changes. If switching between a larger number of columns and mobile phases is required, the Agilent 1290 Infinity II Multimethod solution is the instrument of choice. 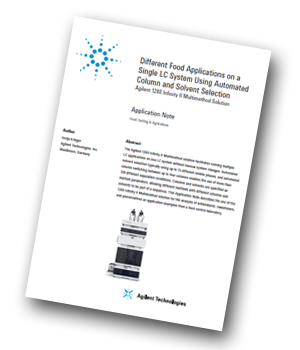 Using the 1260 Infinity II Multimethod solution for the analysis of antioxidants, sweeteners, and preservatives as application examples from a food control laboratory analyses can be performed in a single sequence by selection of the column and solvents used as method parameters. The Agilent 1260 Infinity II Multimethod solution supports running multiple LC applications with different columns and mobile phases on one LC system without manual system changes. Excellent retention time and area precision were obtained for all application examples. Based on retention time and UV spectra, antioxidants, sweeteners, and preservatives could be identified in food and cosmetic samples.